The Census has data on New Residential Housing. I got the data out of the Housing Starts Excel sheet. I'm going to focus on just the single family homes. 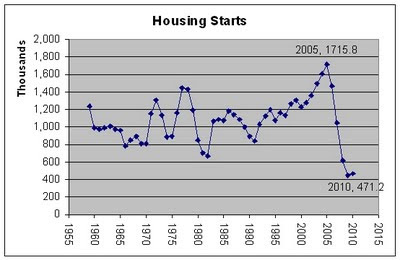 You can see the giant drop in new housing starts from 2005 til 2009. In 2005 there were 1.7 million new houses started and by 2009 it had dropped to 445 thousand. Thats about a 75% drop. Also notice that the 2009 and 2010 construction levels are far below the housing starts for previous decades going back to when the data set starts in 1959. 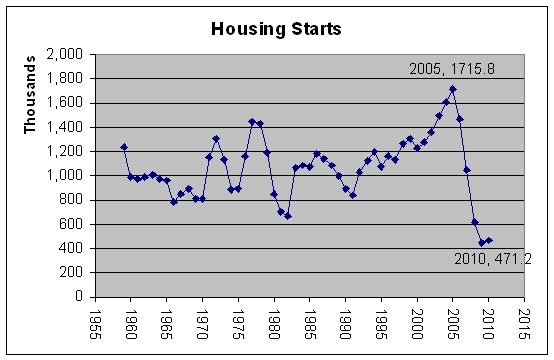 In total from 1959 to 2010 there were about 55.5 million housing starts for single family homes. During that same time we went from about 52 million households to over 115 million. Thats an increase of 63 million households. Of course many of those households are renting in apartments and 2-4 unit housing. Home ownership rates increased a few percentage points as well. In 1965 home ownership rates were 62% and by 2010 they had hit 67%. Another factor driving new home construction is the deterioration and demolition of old existing housing causing a need for replacement housing. Netflix Price Hikes : What to Do?